Bereavement gifts are available for the loss of family or friends. We can wrap all of our funeral pieces in cellophane and offer to deliver them to our three local funeral homes free of charge. Inspirational and dÃ©cor pieces for church and home. Aromatic candles, wax melts, car fresheners, lotions, sachets, and our amazing laundry detergent. Trilogy candles, Hearthwick Flame candles, wax melts, car fresheners, and diffusers in the top ten scents. Room sprays, candles, potpourri, refresher oils, and wax melts available in the most popular fragrances. We are your exclusive Lampe Berger dealer in Paragould, Arkansas. Clean and fragrance your air at the same time with our famous lamp oils, diffusers, and car fresheners. Stop by and see one of the largest Willow Tree selections in Northeast Arkansas. These are great collectibles and gifts for any occasion. Exciting, colorful T-Shirts for any age. Lines include Cherished Girl and Kerusso, one of the best T-Shirt companies in America. The Natural State postcards, coffee mugs, piggy banks, salt and pepper shakers, spoons, and toothpick holders. A variety of gifts for new parents and their little bundles of joy from picture frames to keepsakes. Quality Rada Kitchen knives and American made Case knives. We have a vast collection of gourmet foods including Culp's local honey, Resident Chef dip and dessert mixes, Granny M's homemade pepper jellies, Aspen cider mixes, Texas Chili mix, Panhandler Cornbread mix, and Russell Stover candies. 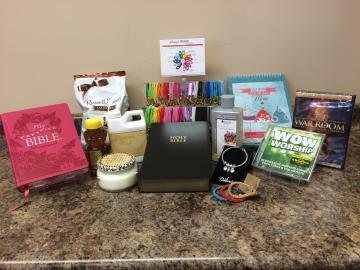 We put together a variety of gift baskets with store product for any occasion. We also make food and fruit baskets that can be delivered to the local hospital for patients and their families.